BitCanuck runs a professional brokerage and exchange service that is specialized in helping you to buy bitcoin as well as other major cryptocurrencies. We have adopted right from the start of our operations a policy that reflects our commitment to continuously improve the detection, prevention, and deterrence of money laundering and the financing of terrorist activities while ensuring the protection of personal information under our control. As such, it is necessary to identify our clients. Why is this KYC important? The ideology of verifying who is buying a cryptocurrency is in sharp contrast with the hype created around the idea of an anonymous transaction. This is where we have spent a lot of time debating on the need of implementing a Know Your Client process, even though at the time we launched, it was not a legal requirement. Primarily because the cryptocurrencies were not considered “money” but rather a commodity. KYC is a process used in financial and other industries that are required to identify clients and confirm their identities in order to prevent, detect and deter money laundry and the financing of terrorist activities. It is important for us to do our own bit and contribute to an environment in Canada that keeps us all safe. The importance for you, our Client. – With various safeguards in place, we may be able to prevent an unauthorized use of your Identity that may have been picked up in the past without your knowledge by fraudsters and used now in the set-up process of a BitCanuck account. – It also reduces the chance of scams that we are fighting on a continuous basis. – Without a KYC in place, the chance of a bank deciding on freezing funds upon transfer is significant and we absolutely do not want to have our clients exposed to such an event. We believe that trust builds business. It is the only long-term solution to maintain a trusted relationship with the entire ecosystem that we are proudly part off and call Canada. Includes banks, service providers, regulatory bodies and each and every one of our trusted partners and clients. With the introduction of multiple services such as ICO and Token sale services, The KYC process is the only way BitCanuck can check the source of funds raised during the token sale by verifying each buyer’s identity and residency. This applies to all digital assets or commodities. 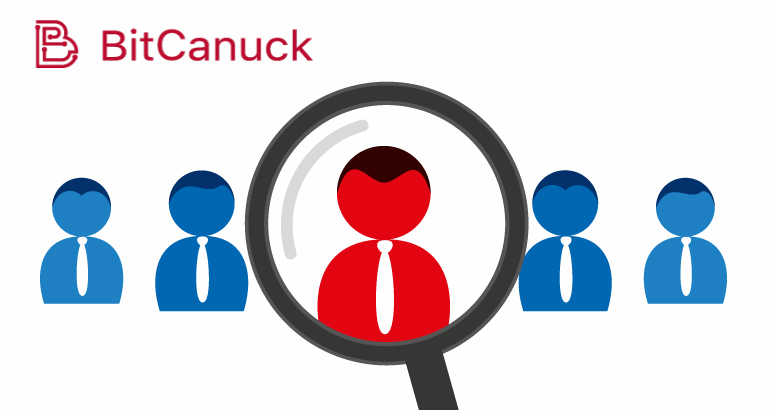 While we are part of a larger group that creates worldwide synergies in the blockchain space, at BitCanuck we only accept Canadian residents and Canadian legal entities as our clients. Our business approach is global but local when it comes down to regulations. For example, our sister company CryptoCoin.pro will execute KYC processes in the European space as the primary jurisdiction. This where we have spent a lot of time debating on the need of implementing a Know Your Client process, even though at the time we launched, it was not a legal requirement. Primarily because the cryptocurrencies were not considered “money” but rather a commodity. We have decided that we can’t be wrong doing the right thing. No funds can come from illicit activities, from organizations that are linked to terrorist financing, sanctioned individuals. The platform steps are self-explanatory as a new user is creating the first time an account. We are also continuously improving and making this process more user-friendly. As one example we have developed solutions that will ensure that we do not ask our Clients the same information over and over again. This frustrates the user, who believes that the information should already be there in the system. – The step by step process is collecting information such as your name, email address, phone number in a first step. Make sure that the phone number provided is SMS capable. – Additional steps are collecting typical documents that could be uploaded straight into the platform like a passport, Identity card or driver license. – The next step is to verify your residency. Multiple options are available for proof of address such as utility bill, bank statement, official government letter that shows your address. – Afinal step is a selfie with the ID and a paper dated and signed requesting verification and account opening. Once all the documents are submitted we have statistically completed KYC in 50% of the cases within 24 business hours, 40% within 48 business hours and 10% within 72 business hours. Each case is individually reviewed without compromise to the actual verification process. The difference in estimated completion time is driven by new user registration volume. Be alert for impersonators. When in doubt with who you are communicating, contact us via customer service. Let’s start your user registration and KYC verification right now!